Laundry Cards are free, and you can earn bonuses. Experience the convenience of using the laundry without the hassle of carrying coins. Add value with cash or credit card. 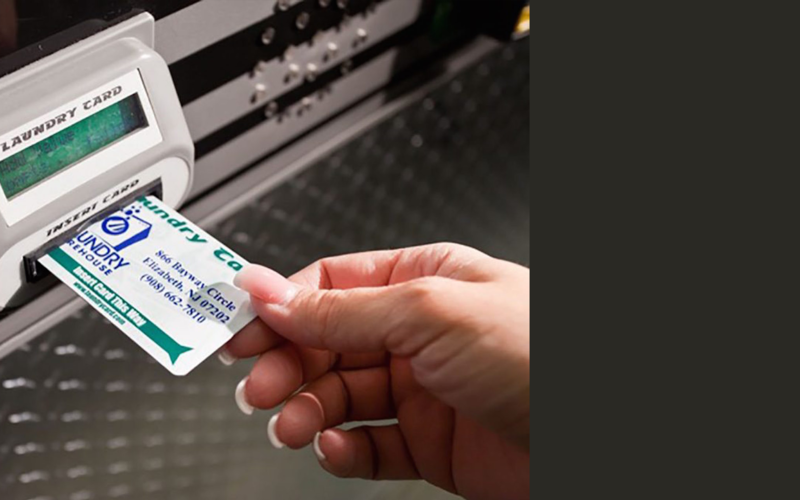 Laundry Card is available at many Laundry Warehouse stores. Check out "accepted payment methods" at your Laundry Warehouse location. 1. To purchase a new card touch English or Spanish on the X-Changer touch screen to choose your desired language. 2. Touch the option to 'Get a new card' from the menu. 3. Insert cash, after each bill the screen shows how much money is on your card. Touch 'Finished' and your new card will be dispensed. 4. In some locations it may be possible to use your credit card to purchase a new card. If this feature is available then you will see an option on the screen that you may select to use a credit card. Once this option is selected you will be prompted and guided through swiping your credit card, entering a value to transfer, and processing the transaction. A receipt may be available from a remote printer in the store, see the store attendant for the location of the receipt printer or follow the onscreen instructions. 2. Insert bills into the bill acceptor and your balance will be updated automatically. 3. If you received any bonuses your balance will be automatically updated and you will see 'Touch For More Details' in the balance window. 4. Touching the balance window will show you the breakdown of bonus and balance info. 1. Insert your card into the X-Changer, and the correct balance appears. 2. Remove your card when you are done. 1. Touch the 'Card Activity' button/tab on the top of the screen. 2. View the activities of your card in date and time sequence. 1. The card reader will display the current vend price. Insert card in the card reader on the machine and then when prompted, remove it. The machine starts if sufficient value exists. 2. Some machines require the Start button to be pressed after the card reader has approved the transaction. 3. The card reader shows how much value is left on the card and how long the machine will be busy.